Entrance to the Secure Psychiatric Unit at the men's prison in Concord. 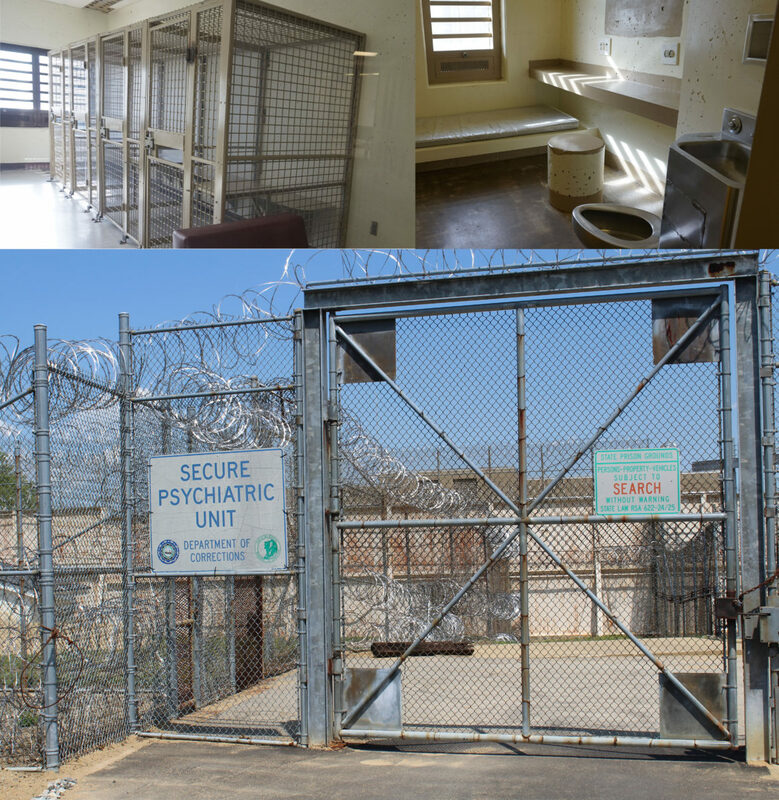 Above left shows four units used for group therapy and at right is a photo of a cell in the unit. CONCORD – There is a federal “law enforcement proceeding” going on at the Secure Psychiatric Unit at the men’s prison, but state officials have not said what it involves or whether they know about it. The revelation was made in a federal response to Rep. Renny Cushing’s Freedom of Information Act request that he filed in May seeking information about a complaint he lodged two years ago alleging federal civil rights violations at the Secure Psychiatric Unit. The letter to Cushing, a Hampton Democrat who has been demanding change at the controversial unit for years, was from Tink Cooper, acting chief of the Freedom of Information/Privacy Acts Branch in the U.S. Department of Justice’s Civil Rights Division. Read the letter here. Attorney General Gordon MacDonald has not responded to requests for more information, and Corrections Commissioner Helen Hanks declined to comment, referring questions to the Attorney General’s Office. Gov. Chris Sununu also didn’t respond to a request for details about the law enforcement proceeding. Cushing has long opposed the state’s policy of locking up mentally ill people who haven’t committed a crime in the state prison’s Secure Psychiatric Unit because they are deemed too dangerous to themselves or others to be housed at the state’s psychiatric hospital. needs to be subject to stringent oversight and accountability,” Coulter said. Cushing coincidentally received a letter last week from John M. Gore, acting assistant attorney general in the U.S. Civil Rights Division to U.S. Rep. Carol Shea-Porter who had sought information for Cushing about his civil rights complaint. According to the settlement agreement in that case, “the state is to provide intensive community services through mobile crisis and assertive community treatment teams to help de-escalate crises and to address individualized needs onsite in community settings, without the need to transfer people to the New Hampshire Hospital or the Secure Psychiatric Unit,” Gore wrote. Vogelman, who represented Mealer’s family, said the state settled a lawsuit he filed on behalf of Mealer’s estate a few months ago without admitting fault. Vogelman said he wasn’t immediately sure of the amount of the financial settlement, but said the state agreed to the changes he proposed to formalize changes in how medication is dispensed at the unit. The state didn’t respond to requests for the settlement amount. “One of the major (contentions) in the Mealer case is the state was alleging (the Secure Psychiatric Unit) is a prison so they don’t have to do what hospitals do, but when they testify in front of the legislature, they say it is a hospital, not a prison,” Vogelman said. The lawsuit claimed Mealer’s death was caused by “acute amitriptyline intoxication,” a drug he was being prescribed at the time. The medication procedures the state adopted in the settlement include having someone watch the patient take and swallow the medicine, and have the same person who sorts the medication also deliver it to the patient, Vogelman said. Vogelman also represents the estate of Phillip Borcuk, who was 34 when he died at the Residential Treatment Unit, which is upstairs from the Secure Psychiatric Unit at the men’s prison. Vogelman said he is still gathering information in Borcuk’s lawsuit. The Disability Rights Center opened an investigation into Borcuk’s death and filed in federal court earlier this year seeking timely release of information about his death from the Department of Corrections. The attorney involved in that case, Andrew Milne, couldn’t be reached for comment on Tuesday.